Leaders decide which story wins. Is as important as what you achieve." "You create the future you make time for." Dave Jennings accelerates leadership results. In the trenches with executives and managers implementing global and local change initiatives, he understands the risks, stresses, and opportunities. He has coached, trained, prodded, and cajoled thousands of leaders and high-potentials from blue-chip companies such as Deloitte, ExxonMobil, and Hewlett-Packard. He has been a featured speaker to leaders in Europe, Africa, Middle East, India, Asia, Australia, North America, and South America. His approach is pragmatic and accessible. "Dave is results driven and a master facilitator." At Intel, his prodding led to $12M savings in one conversation. At Microsoft, his partnership in change initiatives led to breakthroughs that facilitated the launch of half billion dollar projects, achieved awards, and returned millions of dollars. His change management framework at the software giant was adopted world-wide. With a PhD in Sport Psychology and emphasis in Organizational Psychology, he knows the world of accelerating impact. His doctoral research tested the tools of change resilience and showed that not only can resilience be learned, it can be maintained over time. Dave is an adjunct faculty member at the Top 3 rated Executive Development program of the University of North Carolina’s Kenan-Flagler Business School working with executives from around the world. Dave is relied upon for expert commentary by The Washington Post, Forbes, Thestreet.com, and Industry Week. 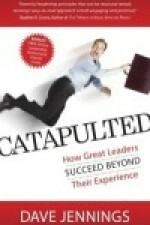 He is author of numerous leadership and change articles and the author of Catapulted: How Great Leaders Succeed Beyond Their Experience. Dave has worked with leaders from a variety of Fortune 500, large, mid-sized, association, and government organizations. "I couldn’t put it down… I felt like it was written just for me… provided ways to speed up my own development as well as my teams." Let's talk about your situation. Call 801.318.5536 or email.